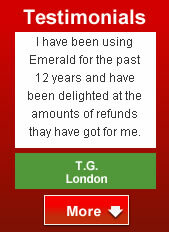 Emerald Tax Refunds are specialists in completing Tax Returns for CIS construction workers. We have been in operation for over 15 years providing a nationwide service and have the experience and expertise to obtain maximum tax refunds you are entitled to. 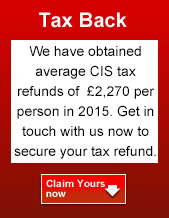 We secured an average refund during 2012 of £2,105 per person which is one of the highest averages obtained for CIS workers. For CIS sub contractors, we offer a fixed fee of only £195 per tax year. This amount includes VAT, so the maximum you pay is £195. If on a rare occasion, the refund you receive is less than £195, we are happy to offer a reduced fee. To make sure you get that refund, however, it is important to keep all records from your contractors showing your income and the tax that has been paid to HMRC along with receipts for any expenses incurred due to your work. This authorises us to act as your tax agent. We will then be able to prepare all the necessary paperwork to support your claims and forward them to you to review, approve and return to us. Within about 4 weeks after the online submission, HMRC will pay the refund to us by bank transfer to our secure clients account. Other than the provision of the initial documentation, we will ensure that you are inconvenienced as least as possible throughout the whole process. However, for those who are quite happy to be more fully involved, there is a document pack you can download and complete at your own pace before you submit it to us. 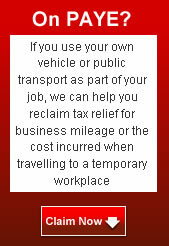 In order for us to complete your Self - assessment Tax Return and get you the tax refund you are entitled to, you will have to provide all of your income and tax details from your contractors in each tax year along with receipts for any expenses incurred by you plus details of your business mileage. You will also need to provide us with Information from any employment under PAYE and any other additional income that you have, such as job seekers allowance or income from a property you may be renting out or income from any investments you may have or bank interest you receive. Travel costs - Own vehicle - this could be for, either actual fuel and other vehicle running costs or it may be more beneficial to you to have the claim based on the actual business mileage you do. We will advise you on the best course to maximise your refund. Please contact us if you need further advice, have any questions about our services, would like a fixed fee quote.